You have TWO WEEKS to play along - Deadline to enter is Friday, December 7, 2018 at Midnight CST. The winners will be announced on the NND blog the following Monday. Becky Noelle creates this red and white striped background using the snowflake die from the Snow Globe Shaker die set. 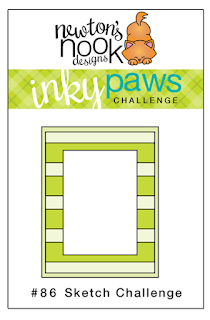 She then creates a fun background using the Fancy Edges Tag die to create the fun edge. 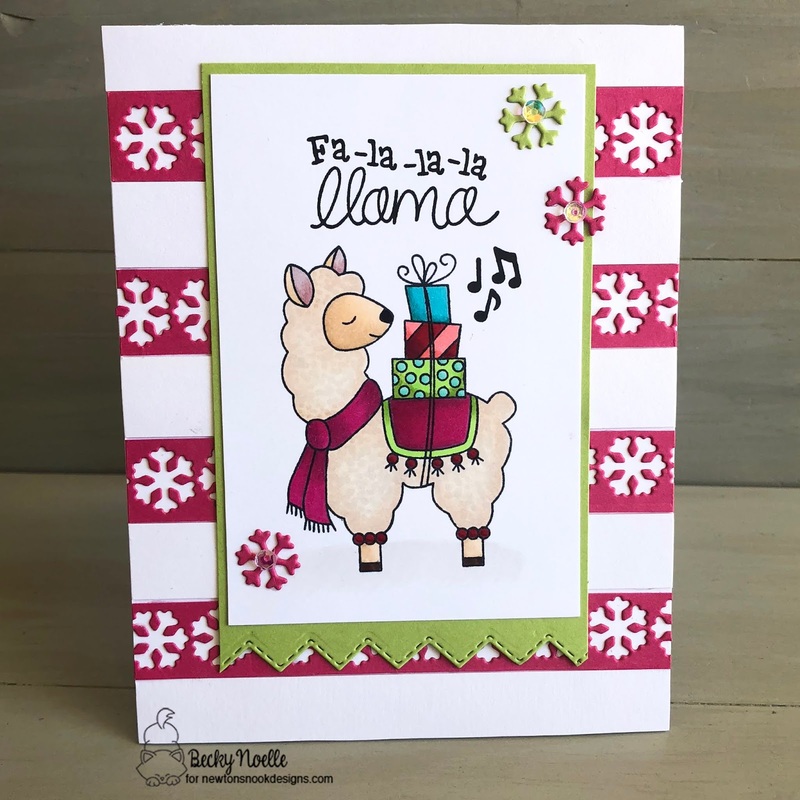 She then stamps and colors this sweet llama from the Llama Delivery stamp set. She adds the sentiment and some snowflakes for her finishing touches! Debbie Owens brings on the glitter by creating her striped background in red glitter paper. She then adds a shimmery green card stock before adding the black sentiment from the Holiday Greetings die set. She adds the kitten from the Newton's Holiday Mischief stamp set. She then adds holly from the Pines & Holly die set and peppermint candy from the Newton's Candy Cane stamp set. Diane Morales presents a very elegant and beautiful card. She uses gray pattern paper for the background stripes. Then she uses the Evergreens stencil to create a romantic scene for her red stamped skating couple from the Winter Memories stamp and die set. Emily Lauritzen creates this playful shaker card with a light blue background. She then embosses a sentiment from the Ornamental Wishes stamp set on vellum. She frames her vellum background with a white frame die cut using the Framework die set. The snowy hills were made using the Land Borders die set. The frozen feline snowmen are from a stamp (Flaky Family) set that has sadly been retired and sold out, but the Frozen Friends stamp set would look lovely too! Sue T. gives us this darling card which features Winston flying through a cloudy sky! She begins by die cutting her base using the Framework die set. She then layers clouds by using the Sky Borders die. 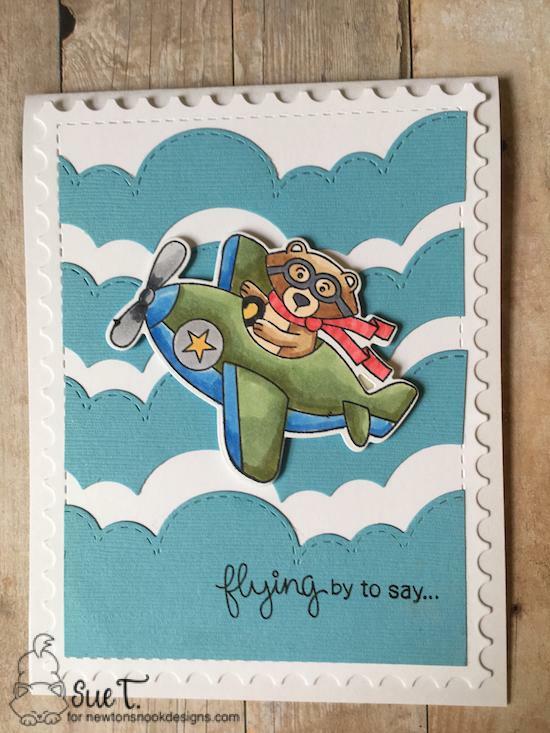 She adds the sentiment and that daring Winston from the Winston Takes Flight stamp set for a delightful, fun card! Thanks for another fun sketch and inspiring creations from the design team.